The so-called experts at Wikipedia have an article on Corn Flakes much funnier than this one. Cereal Is Likely To Spontaneously Combust When You Add Milk. It's True, No Really, We Have Proof. A proposed design if the planned rebranding goes ahead. The term "Corn Flakes" was devised by Mr. John Kellogg, the inventor. It was originally referred to as "Granose", but this was later changed to the far more obvious name "Corn Flakes". This term refers simply to the product, flakes of corn, in what is obviously a retro reference to the good old days of advertising, when you got exactly what it said on the tin (or cereal packet). 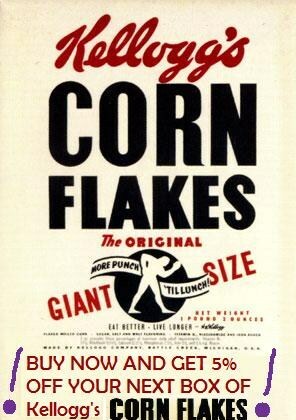 Unless, of course, Mr. John Kellogg was just really uncreative and had no real idea about "brand identity" or "target audience", so when he had to name his product (flakes of corn) he plumped for the name "Corn Flakes". In recent years, the sales of Corn Flakes have been suffering, and a rebranding has been suggested. Similar to what happened with Sunny Delight, the name may be made shorter for more impact in the high-speed cereal market, and it may become "Corny F" in 2010. It appears that nobody in Kellogg's has actually bothered doing their research however, seeing as sales of Sunny D slumped even worse after the new name was introduced. It was 1894 that Corn Flakes were first discovered, when Mr. John Kellogg was playing around with corn. (Not nearly as fun as it sounds, I'm afraid). He discovered, completely by accident, that by treating milled corn with sugar, malt flavouring, high fructose corn syrup, salt, iron, niacinamide and pyridoxine hydrochloride, a crisp, orange flake was made, which was actually quite pleasant tasting. After showing them to his wife, she told him to stop messing about, and start milking the cows. It was during his cow milking session that Kellogg had another brilliant idea. Nobody in their right mind would just buy these corny flakey things to eat dry, so why not serve them with orange juice? Pour a little juice in a bowl, add some corny flakey things (he really needed a name) and voila! His wife disagreed (which she was inclined to do when it came to Kellogg's mad schemes). She thought adding milk to them would be a much nicer idea. She also thought that people could possibly have them for breakfast, to set them up for the day ahead, and if some vitamins were added to the flakes, they could get extra health benefits! John Kellogg, of course, disregarded her completely and patented his corny flakey things...as "Granose". Two years later, after re-mortgaging the house several times, and going bankrupt twice, Kellogg reluctantly decided to follow his wife's advice, and renamed the product "Corn Flakes". He also started marketing them as a breakfast foodstuff, and abandoned the idea of dunking them in orange juice. To his complete surprise (and his wife's satisfaction), the brand took off, and many people started having it for breakfast, with milk. They also wrote to the Kelloggs, asking if extra vitamins could be added to set them up for the day ahead. John Kellogg thought it was a great idea, and wondered why he'd never thought of it before. Soon after that it became the success it is today. John Kellogg proudly became a celebrity inventor, and later devised "Froot Loops", "Rice Krispies" and "Crunchy Nut", along with his wife, who was forced to stay at home and milk the cows. Kellogg's Corn Flakes sell approximately 8,000,000 boxes per week around the world, in over 130 different countries. However, nobody has actually yet worked out why. Many modern scientists have been pondering this question, and Kellogg's Inc. themselves have created a branch of their company that deals with the "Why?" factor, in order to discover the secret, and replicate it to other cereals, such as Froot Loops and Rice Krispies. Currently, there are three popular theories as to the consistently high sales. Corn Flakes may sell in their millions because of the large amount of promotions placed on the boxes, such as "Please Buy Them" (which uses sophisticated pleading techniques to make the consumer actually feel pity for the product) and "If You Buy Them There May Or May Not Be A Winning Ticket Inside The Box", along with "Free Cereal Inside" (which is surprisingly successful, considering that this is not advertising a gift or anything, merely the fact that if you buy this product, you will receive the product, and that is in most cases, a minimum requirement for a box of cereal) and "50% Off Your Next Trip To The Cardiff Dairy Farming Museum". How this promotion works is anyone's guess, as there are actually no cows in Cardiff, and the museum is free anyway. Maybe it is their genius, modern advertisement technique? I mean, who could not be tempted by that offer? 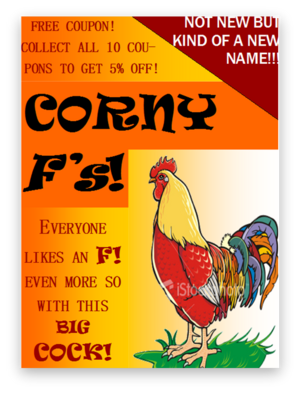 People may continue buying Corn Flakes long after they realize that they are in fact buying excessively expensive tasteless processed corn, possibly because it is a family tradition. If, for example, it was the food they grew up with during the war, they may continue eating it, to give themselves a constant reminder of the horrific suffering they endured for 6 years. Or if they suffered a troubled childhood, but always ate corn flakes for breakfast, they may continue to eat corn flakes to ensure that they never forget the drunken abuse and the moment their Dad came out the closet. It has been proven that eating Corn Flakes consistently for 2 weeks can increase a person's physical performance at sports such as snooker, cheese-rolling and debating. This may account for the higher percentage of male buyers, who buy it to get better at their chosen sport and impress the ladies. This of course may be only an urban myth, but has been shown to work in several different scientific studies, one of which involved real people. Cost. People do not buy Corn Flakes because they are cheaper than other cereal. The reason for this is: Corn Flakes are not cheaper than other cereal. In fact, if you get a pack with a promotion on it, the cereal can be twice the price of the other cereal. Taste. People do not buy Corn Flakes because they enjoy the taste. There is a fairly obvious reason for this: They taste like soggy cardboard. Though soggy cardboard could possibly be a fairly exotic and pleasant taste to a man who has been living off iron filings and mouse droppings for a month, for most people, it is not an enjoyable taste. However, Bulgarians have been known to eat large quantities of the cereal. A similar food called "popara" was used in the early days (by the grandparents and even some of our generation as kids, before Cork Flakes was known). The difference between "popara" and corn flakes is that instead of corn flakes, they put small chopped bread pieces and add sugar (depending on taste). Nutritional Value. People do not buy Corn Flakes because they benefit from the nutrients. The reason for this is: Corn Flakes may be very nutritious, but putting yourself through the monotony of milk-soaked corny sludge for the nutrients is not worth it, when you could just eat an apple. Here is a conclusive list of the three variants of Corn Flakes that have currently been released, to broaden the range, and promote interest in the brand. Wholegrain Corn Flakes (1999) - To make your day healthier, happier, soggier and less appetising. These were suggested by an employee of Kellogg's in 1999, when he was working for the "Why Do People Still Buy This Crap?" department, trying to figure out why people still bought Corn Flakes. Having theorised that they were bought for their nutritional value, a wholegrain version was released to provide more nutrients. However, sales of ordinary Corn Flakes increased, and the wholegrain version was only minorly successful. The idea of nutritional value was later struck off the list of possible reasons people bought them. Corn Flakes'n'Berries (2001) - Corn Flakes with a twist! Someone has freeze dried some "berries" and added them into the mix. It is unknown what kind of "berries" these are, as taste, colour and shape are no help in identifying them. They were discontinued in 2002. This was universally considered a Good Thing. 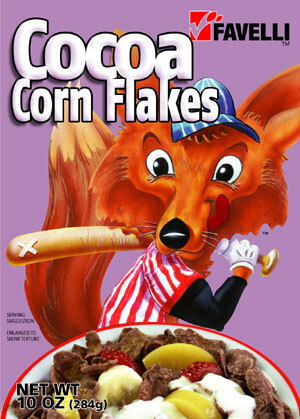 Coco Corn Flakes (2003) - Corn Flakes with chocolate. Yes! Now they not only disintegrate at the bottom of the bowl, but also turn the milk a sickly colour too! These were seen as a replacement to the Corn Flakes'n'Berries, however, they were even less popular. Discontinued in 2003. ↑ OK, I lied. See Weetabix. ↑ Actually, it won't answer any more. Just those four questions. In fact maybe not even the last question. ↑ This story is 100% true, by the way, and was most certainly not made up at a later date to improve the brand's image. No way. Not at all. ↑ Had Mr. Kellog done the proper thing and backhanded his wife for speaking without being spoken to, as was customary for this time period, it is likely that Corn Flakes would not exist as they do today. ↑ This branch is imaginatively called The "Why Do People Still Buy This?" Branch. ↑ Unfortunately, you have to collect six tokens to be eligible for this great offer. ↑ See John Kellogg's Bumper Book Of Jokes: Cereally Funny Stuff!. Honestly, it's a snap, crackle and popping read! This page was last edited on 12 July 2012, at 04:14.